I consider myself a pretty happy person. I’m not saying I don’ have my down days where a pint of ice-cream or a brownie are my only suitable company, but I’ve developed a philosophy of living that works for me and keeps me smiling most of the time. I’m always looking for new experiences and ways of doing things, however, so I keep an eye out for anything with…potential. 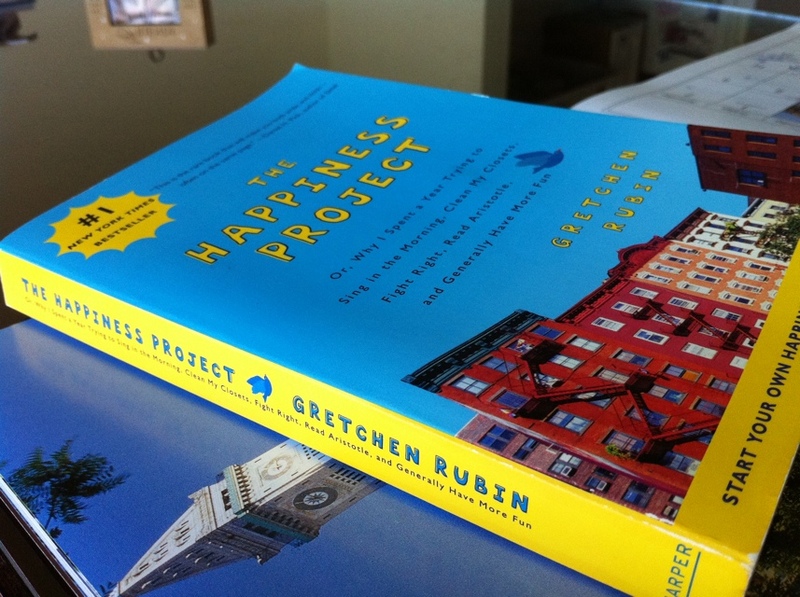 So as I stood at an airport bookstore a few weeks ago, with my carry-on hanging off one tired shoulder and my plane ticket clutched in my hand, I was excited when I saw something that promised a way to pass the time between flights – The Happiness Project by Gretchen Rubin. I’m almost always game for something with the word happiness in the title, especially when it’s accompanied by a brightly colored cover (yes, I am pretty much a 5-year old – bright colors and shiny things, especially sparkles, draw my eye). The premise was intriguing, but also realistic. A woman takes a year-long challenge of incorporating resolutions that were created to make her life happier. Everything else in her life stays the same, so no great trips to foreign countries in this one, and she writes about the good, the bad and the indifferent. Seeing the effort that one person put into learning to be happy was amazing all on its own, but her voice, the attitude with which she approached the challenge, and her methodical way of tracking its success was wonderful. My favorite part of the book is that the idea of a “happiness project” is easily attainable for anyone at anytime. You don’t need to approach it with the intensity that Gretchen did, but rather you can start incorporating happiness resolutions – small changes and goals – today. People really only stop to reevaluate their lives and make resolutions one time a year, but January 1st is not the only day for this. Like many things, you, your goals and your resolutions will change with each new person you meet and passing day. So why only stop to figure out what you can do to make your life better once a year? Why not once a quarter, or better yet once a month? The trick, as was pointed out in The Happiness Project, is accountability. You don’t necessarily need someone else to hold your hand, but you do need to say what you want out loud or in writing and then keep track of whether you actually keep your resolution, day by day. Gretchen has some daily advice over at her blog if you’d like some assistance in getting started and keeping up with your resolutions. She even has the legendary Happiness Resolution Chart (which is super exciting for organization freaks like me) ready for others to use. So despite whether you’re currently happy, sad, or just plain content, take a chance on a new inspiration and perhaps some new happiness practices by picking up The Happiness Project. Because honestly, who has too much happiness in their life?